It’s the beginning of Hanukkah and Christmas is now a mere ten days away. The bitter cold on Michigan’s Upper Peninsula has firmly settled in, snow is once again beginning to hunker down as a powdery, disruptive resident, and everyone — friends, fans, athletes, and coaches — are exchanging gift ideas. That’s what this is, the season of giving. And if you like your presents wrapped nice and neatly, the boys in Marquette should be credited with tying the bow around this one right here. The Arvo Haavisto Cup, which wrapped up this past weekend in Ilmajoki, Finland, represented the final event of the year for United States Greco-Roman wrestlers. That’s it. There are no other tournaments on the schedule for 2017. But what a 12 months it has been, particularly for the athletes from Northern Michigan. In a year when the US scored an astounding 88 international overseas medals across the Cadet, Junior and Senior levels, wrestlers from NMU had 24 of them, or somewhere around 27%. In effort to impart a more appropriate context, the overwhelming majority of international tournament matches contested at the Cadet level involving US wrestlers did not include athletes from Northern. Therefore, if we are to only count Junior and Senior competitions, that percentage goes way up, with NMU wrestlers garnering 23 out of the 59 US medals won. To break it down even further so as just to highlight events where Northern Michigan wrestlers actually participated (12 tournaments including the Junior and U23 World Championships), they accounted for 23 out of 51 total medals, or nearly half. In other words, if Northern guys showed up, chances are they placed. There were 12 overseas events in 2017 that featured at least one athlete who competed for the Northern Michigan-Olympic Training Site. The only two events in which an NMU wrestler participated but did not medal were World Championship events (Junior and U23). Of the 88 total medals won by US Greco-Roman wrestlers overseas this year, 24 went to NMU wrestlers. Of the 51 total medals earned in Junior and Senior overseas events, 23 belonged to NMU wrestlers. 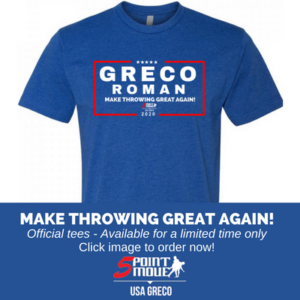 If you remember, this all began on the first weekend of March in Austria and resulted in a history-making performance for both NMU and the USA Greco program as a whole. The US came away with 12 overall medals at this tournament with six champs. Wrestlers repping NMU won the team title since the Austrian Open is by and large divided into club squads, but those are just details. Miranda, who earned his fourth overseas gold of the year this past weekend, got the ball rolling in Austria, but he was expected to. Kass’ win was actually more of a headline-maker at the time, but Nutter checking in with his first international placing as an NMU athlete got some attention, as well. 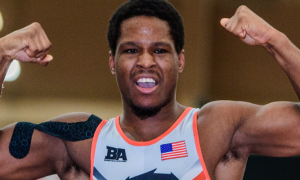 This was an overall crazy weekend for the US, because at the same time in Denmark, the US Seniors put together a very strong showing at the Thor Masters Invitational that saw Ildar Hafizov (59 kg, Army/WCAP) and Robby Smith (130 kg, NYAC) grab wins while Patrick Smith (71 kg, Minnesota Storm) eeked past NMU’s Alex Sancho for bronze. There is little question that Sancho’s performance in Zagreb was one of the biggest moments of the year for the US, not just because he won, but rather, how. In the 66-kilogram semifinal, Sancho had to deal with 2016 U23 European Championships bronze medalist Mate Nemes (SRB), a champ at this event in 2014. Down by a point in the first period, Sancho had Nemes hawking over him when he basically just reached up and around Nemes’ head and arm to toss him for four. Nemes tied the score later on, but it didn’t really matter since Sancho held criteria. The American then prevailed over Mihai Mihut (ROU) 5-3 in the finals on the strength of a four-point front headlock, one of his go-to maneuvers. The tournament victory was Sancho’s first across the Atlantic. Oddly, Porter only had one bout the entire day, a 2-1 decision loss at the hands of Soh Sakabe (JPN). Still, he showed up and took a bronze. It counts. All told, Team USA grabbed three other medals and they were all bronze — RaVaughn Perkins (71 kg, NYAC), Kamal Bey (80 kg, Sunkist), and Toby Erickson (130 kg, Army/WCAP). It is difficult to argue against a gold medal, but the Tbilisi Grand Prix might have been Sancho’s more impressive showing. For one thing, he had more matches to get through just to make the final (three). But once again, it’s how, not just what he did at the tournament that deserves to be acknowledged. First, Sancho blitzed Gor Sirekanyan (ARM) via tech to open up his day and then in the quarters, he repeated the feat against a decidedly more experienced opponent in Mate Krasznai (HUN). Krasznai went for an arm throw; Sancho slid behind for two; then he locked on a straddle lift and nailed two; he re-locked, lifted, and cascaded it over again to end the match. The semis delivered more of a brawl. The only pair of offensive points that came Sancho’s way opposite Goga Gogiberashvili (GEO) arrived at the end of the first via takedown. A passive and a caution-and-two on the Georgian in the second provided the two-point cushion Sancho needed to emerge 5-3. The finals matched Sancho up with Daniar Kalenov (KAZ), who a few months after this tournament won the somewhat-prestigious Asian Indoor Games. Kalenov, for whatever reason or another, was gifted two passivity points even though it was Sancho who (seriously, no bias) was owning most of the positional battles. Nevertheless, his work and workrate went unrewarded, forcing him to bite down on a frustrating 2-0 loss. But a silver at that tournament is nothing to sneeze at, certainly. Joining Sancho on the medal stand for the US was two-time Olympian Ben Provisor (85 kg, Nittany Lion WC), who fell to eventual World bronze medalist Robert Kobliashvili (GEO, world no. 4) in the finals. The Campbell Cup has become the ultimate “loosen up” event for Northern Michigan wrestlers. It’s not a high-level tournament, but the opportunity to get matches early in the season along with the fact that there are usually a few solid opponents to bang heads with continues to make it a worthwhile endeavor. Especially for someone like the talented-but-seemingly-snakebit Morrow, who at this year’s Campbell Cup was just returning from injury. As you are likely aware by now, Morrow has had serious shoulder issues recently and unfortunately is once again on the shelf until further notice. But he was just fine for this thing, Morrow was. On the day, Morrow recorded five tech’s and a pin en-route to gold. One of his opponents was fellow Northerner Rodgers, who snagged a bronze. Johnson had went up to 98 kilos for the University Nationals, but he swooped back down to 85 to kickstart his season. Outside of Elton Brown (PAN) managing to stay upright for the most part in the 85 finals, Johnson was dominant, scoring tech wins over Aristedes Sanchez (PAN) and teammate Sikes, who placed third. Fitzgerald went 3-2 in the round-robin 75-kilo bracket, good for a runner-up finish. Both of Fitz’s losses were to the extremely-experienced Alvis Almendra (PAN). But what about those three wins for Fitzgerald? They were all one-sided 8-0 drubbings, which was nice to see for him as he continues to do whatever he can to harden up with foreign competition. These two motivated young men from Wisconsin had barely arrived for a multi-week training camp in Denmark when, by themselves and with no US coaches present, put together a day of competition they’ll likely always remember. Nutter pretty much crushed everyone he faced at the Bear Cup. Not one of his opponents went the distance or came all that close to doing so, and he racked up three techs and two pins on his way to the top spot. It was wall-to-wall dominance for Nutter and a groundbreaking day at the office for him. As such, he was named the tournament’s Outstanding Wrestler. However, Peak’s bronze is just as important to recognize for one very obvious reason: it was both his first tournament back following labrum surgery, and also, his first tournament as an NMU wrestler, period. In order to snag his medal, Peak was forced to come from behind in heart-stopping fashion. Down by three to Lauri Karjalainen (Ilmajoen Kisailijat) with only five seconds remaining, Peak lowered in for a high dive and instead of finishing at the body, he popped up and lassoed a headlock he dumped over for four points at the buzzer. It was adrenalizing in every way imaginable and ultimately proved to be a confidence-boosting catalyst for his next two performances. The Klippan Cup held some meaning to Miranda. A one-and-done day at the Junior Worlds bothered him greatly, even if that loss put all of his intangibles on display for everyone to see. 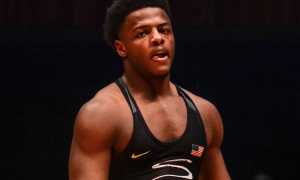 Six weeks after that, the 20-year-old advanced to the best-of-three finals opposite teammate Dalton Roberts at the U23 World Team Trials only to drop the first two bouts. Miranda’s overall year had been terrific up to that point, but he wanted to close 2017 on the highest note possible, hence his participation on the highly-successful Sweden tour. Back-to-back techs over Linus Markusson (SWE) and Northerner Jon Massey gave way to a tight 4-2 decision for Miranda against Christoffer Svensson (SWE). That put him in the finals with Anton Rosen (SWE), a familiar face due to the working relationship between the US and Sweden. Miranda was up 4-1 in the second period when he tacked on a step-out point and two off of an arm-throw counter to create a six-point margin he would not relinquish. For Peak, the Klippan Cup was another revelation. Tech wins over NMU’s Erik Spence and Luis Hernandez (OTC) deposited him into the semis where Rosen gave him a dose of his medicine. But Peak did more than just dust himself off in time for the bronze-medal match. Because however inspirational his comeback in Denmark was, his victory for bronze at this event might have been even more startling. Against the aforementioned Svensson, Peak was clicking at his highest level yet, climbing out to a 7-3 lead before tossing him for four to end the bout early. In case you haven’t detected the pattern yet, Miranda’s name is one that appears a lot. And for good reason — there is no other US wrestler who has won more international medals this year. That trend continued at the Malar Cupen, as Miranda accumulated four technical falls and one pin to notch his third overseas gold of 2017. Peak, wrestling in the tournament’s Cadet/Junior division, had eight matches on the day, and wouldn’t you know it, but he won seven of them via tech. 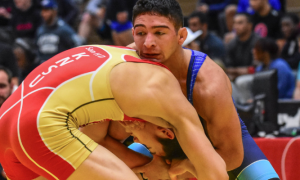 In fact, the only bout in which Peak did not secure a tech fall came against the US’ Dominic Damon (WA), who opened plenty of eyes himself with a third-place performance. Should Nielsen’s career pan out the way many are hoping and expecting, the Malar Cupen will be looked at as sort of his ice-breaking performance, the one that put him on the map a little bit. Plain and simple, Nielsen destroyed all four of his opponents heading into the finals, where 2016 Hungarian Grand Prix silver medalist and Danish World Team member Rajbek Bisultanov awaited. Bisultanov owns a much more significant competitive resume at this juncture and his advantage in experience played out to the tune of a one-sided loss for the Minnesotan. But, come on. Carter Nielsen was and is still learning. So let’s have this conversation again in a year or two. After shocking two-time NCAA Division I champ and supposed uber-prospect Gabe Dean right out of the U23 Trials (and subsequently, Greco altogether), it was heartening to see Wilson grab himself some hardware at this event. Wilson lost his first bout at the Malar Cupen and caught a bye to the bronze round, where he ran over Elias Kenneryd (SWE). In a just-as-important development, Team USA closed out the tournament winning both the Senior and Cadet age group team titles for the first time in history. Rather than head on home after the U23 World Championships, Roberts stuck it out in Europe for a couple of weeks to pile on some additional training. Part of this training regiment involved lacing them up for the Lavrikov Memorial. Needless to say, the brackets were packed with up-and-coming Russian competitors, and because that country is widely seen as the standard bearer in Greco-Roman wrestling worldwide, doing well at the tournament carries a little weight. Even with that, Roberts and Miranda both managed to make the 59 kilogram finals, resulting in their fourth meeting in 13 months. There is no video available for this match. All we know is that it unfolded similarly to how most of their previous clashes have — contentious, close, a little heated in spots, and with Roberts winning by a couple of points. The lion’s share of Miranda’s overseas wins in 2017 were beatdowns. Prior to this past weekend, only a handful of his opponents had even been fortunate enough to make it to the six-minute mark. The Haavisto Cup wasn’t going to offer too many walkovers. It is a “true” Senior event offering a decent number of quality competitors. While it was absolutely within Miranda’s scope to do well at this tournament, you couldn’t be drop-dead-100%-sure he was going to win, if only because you really didn’t know who he might have or if the yearlong slate of constant competition had caught up to him yet. Miranda gutted and gritted through all three of his matches on Saturday to earn his fourth overseas title of 2017. He was pressed on occasion by Igor Kurochkin (UKR) in the semis, but turned on the jets when he needed to opposite Juuso Latvala (FIN) in the finals to come away the 6-3 victor. Miranda’s gold also provided Northern Michigan with its 24th medal won outside of the United States this year, but this number is a mere starting point. With just one look at the roster, as well as imagining what new faces might be in the room come 2018, and it very much appears like Northern could be on the verge of a dynastic era similar to the mid-2000’s. It doesn’t happen all at once. Stars like Sancho, Roberts, and Miranda didn’t just show up and begin winning medals. It is a process, and one that can be especially painstaking in the early going. Thing is, the building blocks are already in place and following a 12-month period that ushered in unprecedented growth for the program developmentally, it is not unreasonable to expect the achievements of the past year to be eclipsed in relatively short order.